We took a break from these updates last week so this is going to be a kind of long post! 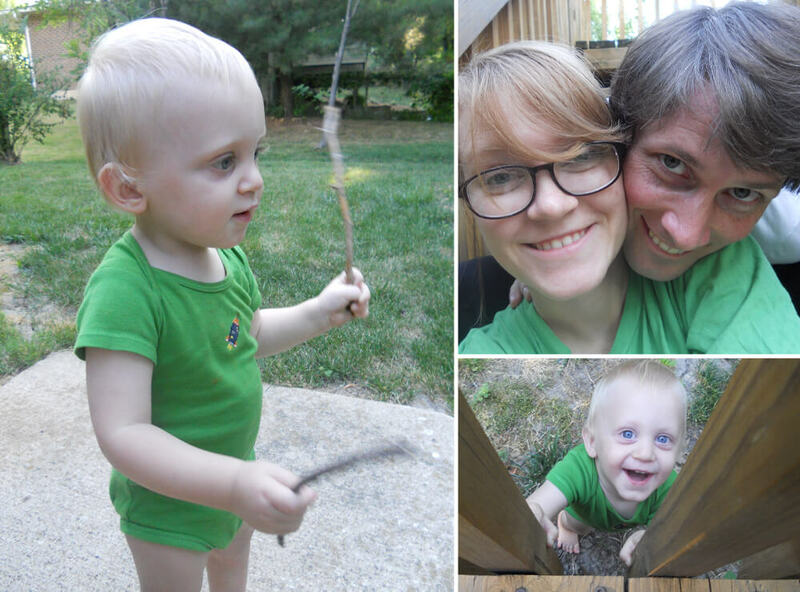 We didn’t really take a break from going outside, but we didn’t take many pictures. We were busy having fun. And the break was nice. Now that we are visiting family and I got a new camera lens (yay!) I have been taking a million pictures a day!! Juniper went to sleep quite a bit early tonight. Which really means she took an incredibly late nap and then was up until 11:30… While she was asleep though, Flynn and I played peek-a-boo in the back yard and threw sticks around. He is so funny. We bought me a new bike! 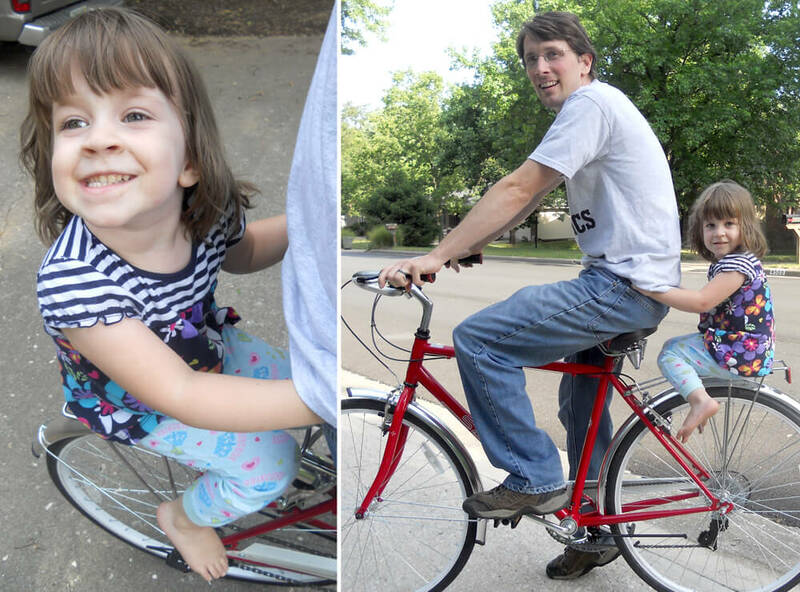 Dad took Juniper for a quick ride down the street. She screamed “This is AWESOME!!! !” at the top of her lungs the whole time. She is definitely a fan of bike rides! Now we just need to find a trailer. I brought home a car load of craft supplies today. (From a friend who was needing to clean out some storage space. Can’t turn down free craft supplies!) 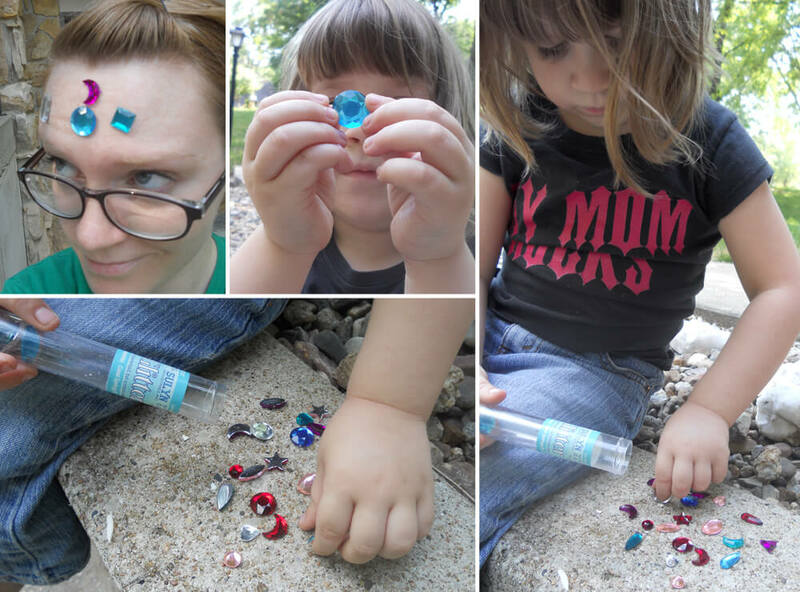 Juniper called dibs on these little plastic jewels and we had some outside creative time. Once I showed her that I could get them to stick to my forehead, that’s all she wanted to do with them! Aunt Shannon came over for dinner tonight and we were able to give her her birthday present. A travel fitness hoola hoop! I so want one now by the way, that thing is awesome. 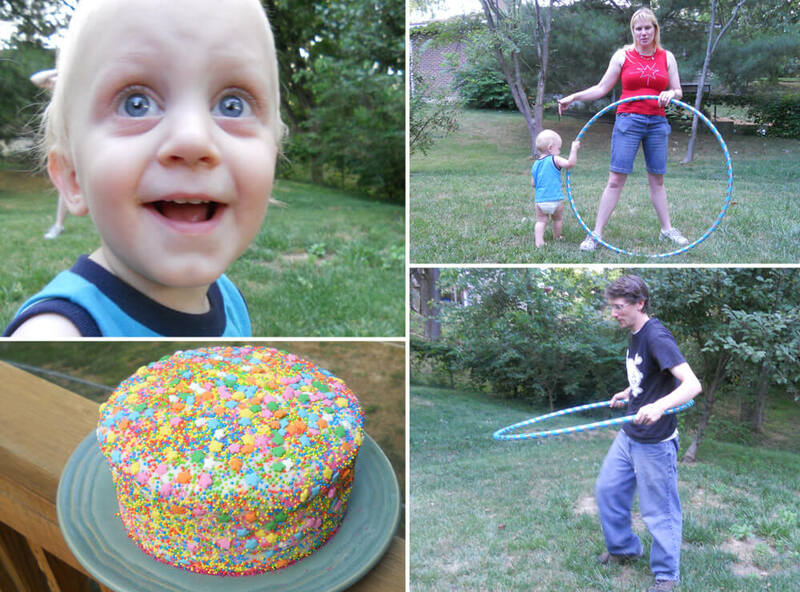 Flynn was quite impressed with Shannon’s hooping, while Juniper and Oma tried to catch bugs with the bug nets Shannon brought over. Also, I made the coolest cake ever! Sprinkle overload! Welcome to CT! 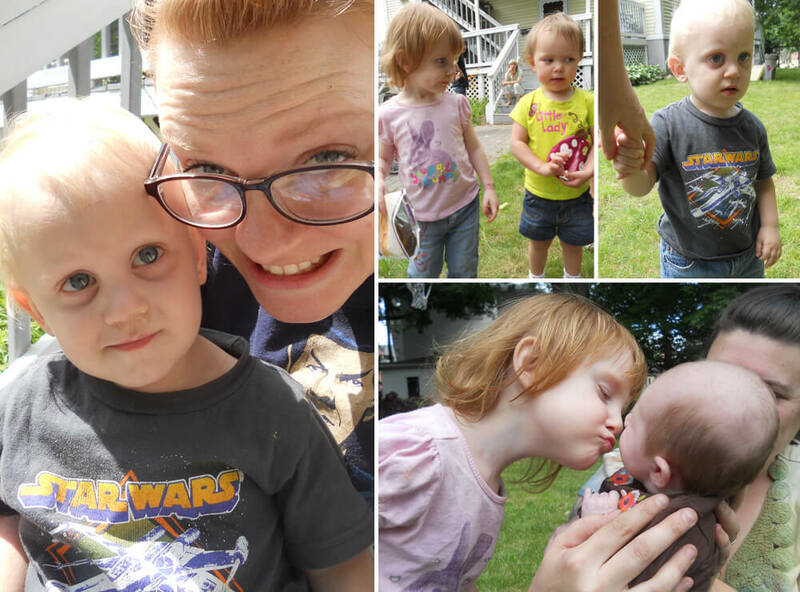 For the first time in a whole year, all of the grandkids were together! And there is a new one in the mix, my brother’s little girl is so adorable. (I’ll share some cute pictures I took tomorrow!) (I didn’t take the pictures tomorrow, that sounded weird haha!) Flynn wasn’t so sure how he felt about all of the new faces. He was being quite shy. Juniper on the other hand, was running around like a crazy person as usual. Today was SO HOT. 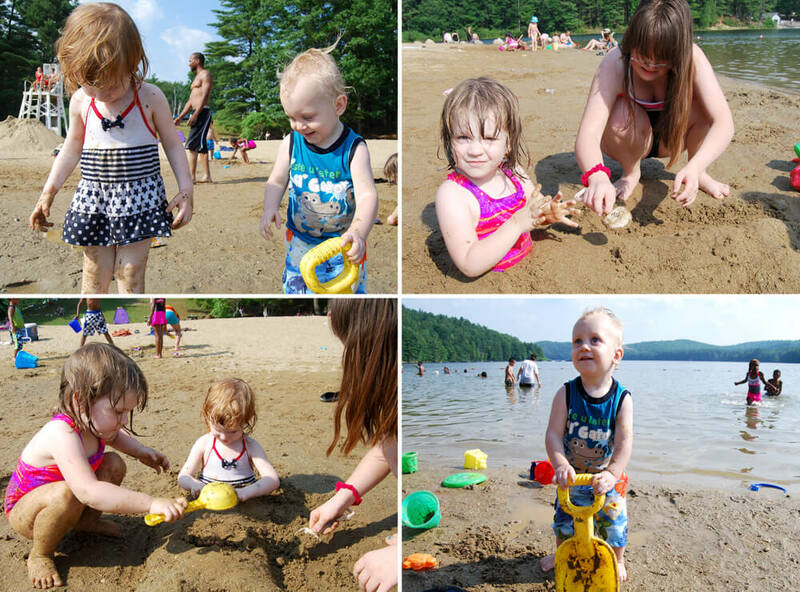 So my sister Heather and I loaded up the kids and went to the beach for a quick cool off. Heather buried Juniper and gave her a mermaid tail, then Juniper buried Piper. Flynn LOVED the beach. Even though when we first got there he did a face plant in the water, he quickly recovered and had a blast. We only spent maybe an hour there, I’m hoping we can make one more trip before we have to head home. My not-so-baby-anymore sister graduated today! It was so ridiculously hot. And outside. The kids did not enjoy the ceremony very much. 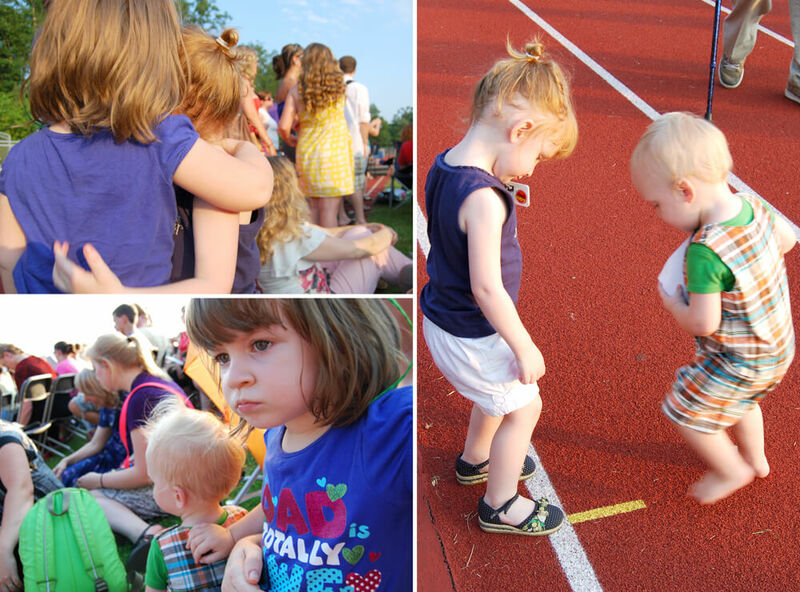 But once the sun went down some it wasn’t so bad and we had fun running around the football field taking a million family pictures once graduation was over. Heather and I were going to try to take out her new canoe today, but it ended up raining a ton. 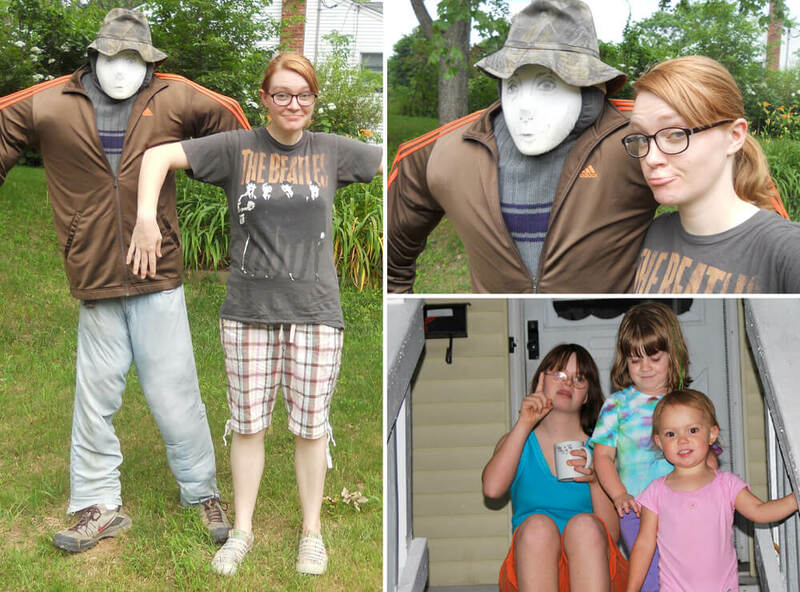 So instead we hung out at our brother Lorn’s house for a bit, I got acquainted with his awesome scare crow, and then we headed out for some thrift store shopping. Always a good alternate plan! 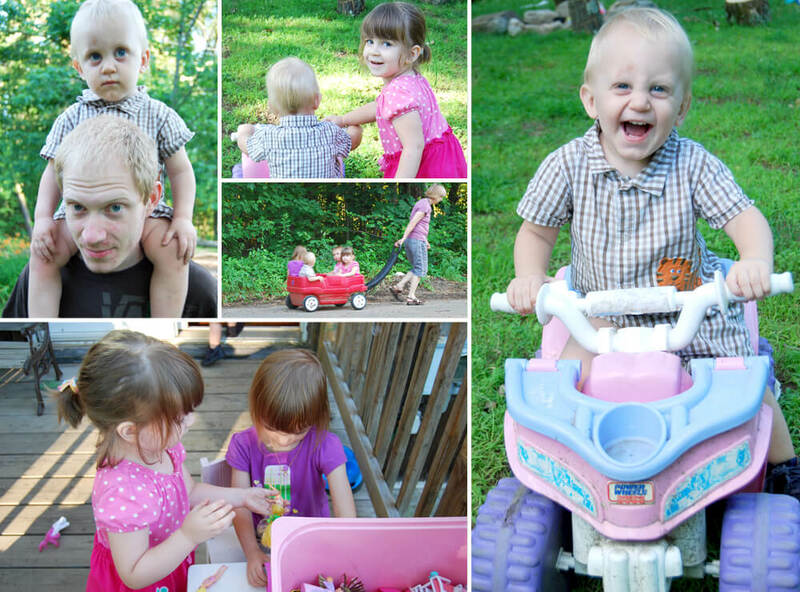 The kids stayed behind at Mima’s house and played with their cousin River and Aunt Tesha. Today was beautiful outside. It was much cooler outside because of the rain. Bella and Juniper played in Mima’s yard all afternoon, and then for dinner we went to my sister Lil’s house and played some more! Uncle Allyn won Flynn over by taking him to a nearby construction site and showing him all of the big trucks. And Juniper got to try rollerskating for the first time! The kids all had lots of fun playing together.